Alabama is located in the heart of the southern U.S. with approximately 23 million acres of timberland (2017 Alabama Forest Resource Report). 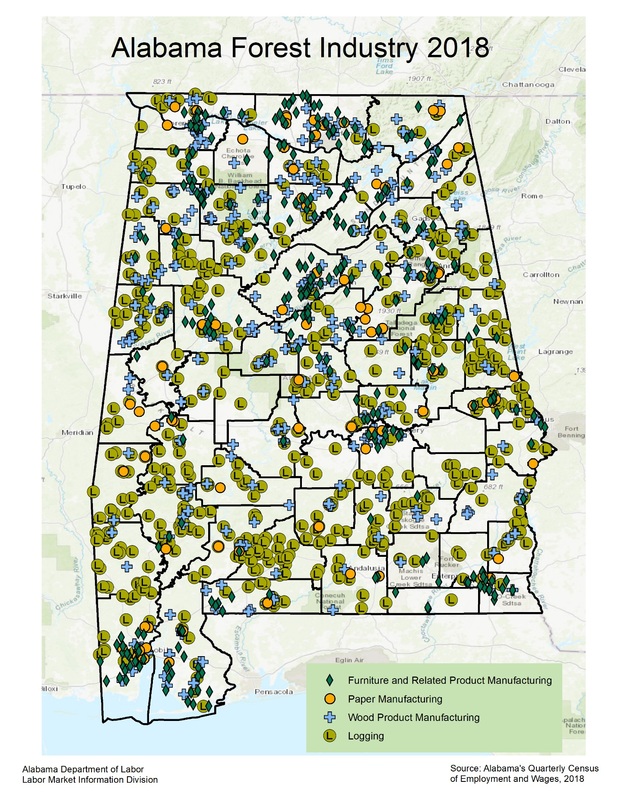 The single most prevalent forest type is softwood (mostly pine) at 45% of stands, followed by 42% hardwood stands, and 13% mixed hardwood/pine stands (2017 Alabama Forest Resource Report). Alabama has the third most timberland acreage in the 48 contiguous states, behind only Georgia and Oregon. 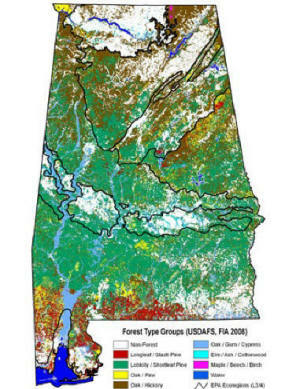 The state’s timberland acreage is 94% privately owned (2017 Alabama Forest Resource Report). That places Alabama second only to Georgia for private commercial timerland acreage. 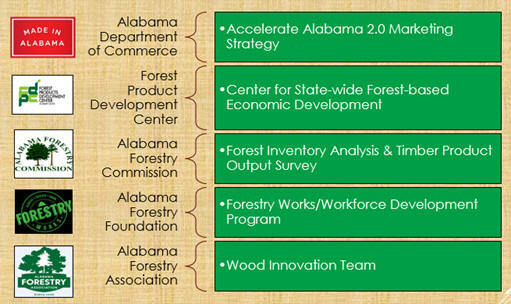 Alabama has 40.3 billion cubic feet of standing timber, the largest recorded inventory in the state’s history (FIA Data). The state is gaining timber volume at a higher rate than most all other Southeastern states showing a 30.8% increase between the periods of 2001 to 2017 (FIA Data). Sawtimber size stands comprise 49% of the state’s timberland, while 28% of forest stands are comprised of mostly pulpwood-sized timber. Seedling/sampling sized stands account for the remaining 23% of timberland acreage (2017 Alabama Forest Resource Report). The state leads the nation in loblolly pine growing stock volume with 523.2 million tons (2017 Alabama Forest Resource Report). The hardwood 2017 growth-to-drain ratio for is +2.11 : 1 (Alabama Forestry Commission/U.S. Forest Service/FIA). 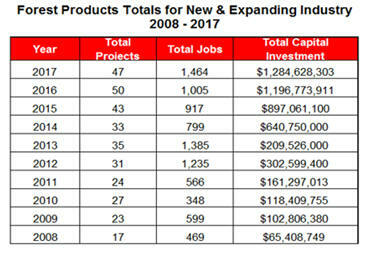 An impressive new & expanding capital investment of approximately $5 billion and 8,800 associated direct job creations has been generated within the previous 10 years (Alabama Department of Commerce/AIDT Forest Product Development Center). Mr. Dan Chappell, Forest Inventory Specialist, R.F. Mr. Gary Faulkner, Forest Economic Development Specialist, R.F.